Oil on cardboard, 36,5 x 23 cm. Two fishermen are sitting by one of Venice’s quay frontages. 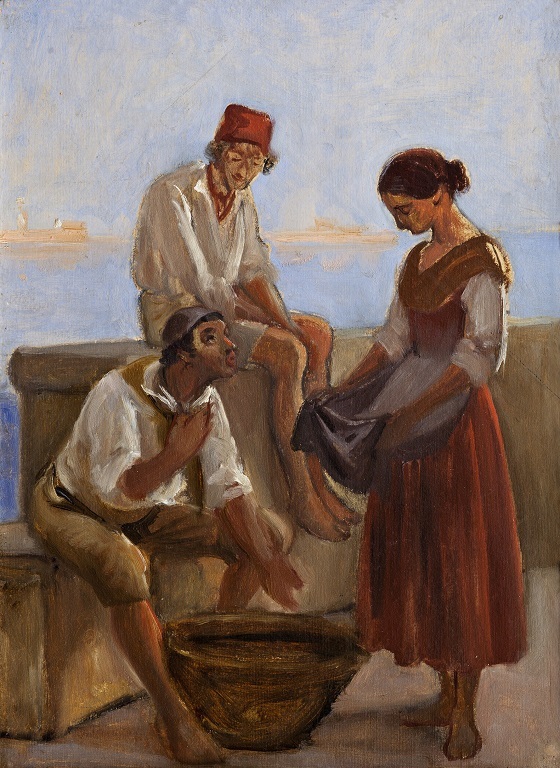 One of them is attempting to catch the attention of a young girl, pointing at the basket with the catch of the day. Behind him sits another fisherman wearing a fez, observing the scene as it unfolds with a private smile. During his stay in Venice, Wilhelm Marstrand was primarily interested in painting the local populace rather than its architecture. In a letter to his wife, he wrote that he found Venice’s supposedly magnificent buildings to be uninteresting and disappointing, while the local fishermen and their everyday lives had caught his undivided attention.